Compatible with 5th Gen iPad 9.7"
Permanently mount your 5th generation 9.7" iPad to the wall or a counter using the MagConnect Bold MP Wall/Counter Mount for iPad 9.7" from The Joy Factory. The wall/counter mount attaches to a wall stud or counter surface using four screws for a secure base to keep your iPad safe. 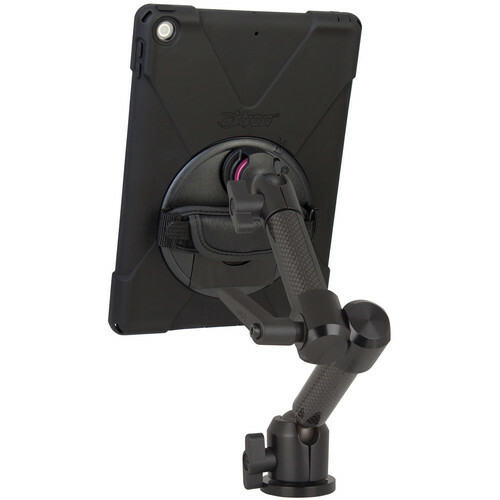 Once the mount is configured, slip your 9.7" iPad into the included aXtion case and connect it to the mounting arm via the MagConnect magnetic connection. This MagConnect Mount offers nearly infinite angle adjustment and the ability to rotate the iPad from portrait to landscape modes to accommodate the content being viewed on the screen. Box Dimensions (LxWxH) 14.3 x 10.3 x 5.8"